It was a pleasure doing business with you. Your crew was efficient and courteous. Crew was courteous and very helpful in answering my questions. We were quite surprised when the super sump began pumping around March 10-15 which was much sooner than our previous pump would indicate, water that normally would have been seeping under the pad for weeks. Our basement looks fantastic! Thank you. Absolutely thrilled with the level of professionalism with the company. (Will have to wait until Spring to find out if it worked - but I'm looking forward that moment! )Would definitely recommend to anyone. Fast, efficient, clean, courteous, fantastic! SHORT NOTE TO THANK YOU FOR A JOB WELL DONE. YOUR CREW WAS HARD WORKING AND KNOWLEDGABLE , DID QUALITY WORK AND WERE A PLEASURE TO HAVE ON SITE. THANK YOU – ALAN W.
I talked to you people yesterday about my new sump. Well I am so happy with it, and the fellow who did it, I can't say enough. Please give the installer a high five as he really is a pro. You have a good day, we will see you in two years when you come to do a service on my system. Wow, love it good job. Great Job. Friendly crew and so far we are dry! We would like to thank you for th every prompt service, a job well done with courteous staff, and installation crew. The clean up was super. Thank you! No problems! Thanks to Terry and Owner Glen from your Edmonton Alberta dealership. They have saved our homes and our family from financial ruin on 2 separate occasions now. Both times we purchased a home with overwhelming basement problems including sump, collapsing walls, weeping tile failure and water damage. They were there in a heartbeat and worked with us to a solution. Their technicians were a pleasure to have around, too. We are very pleased with the work you did for us in August 2010. Your staff did an excellent job & cleaned up so well I would think they used a vacuum, you can certainly use our name as a reference. 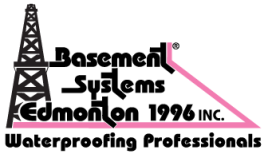 Thank You, Marg C.
Like to say a big thanks for prompt service call and training on the basement sump pump! Appreciated!